If there’s one thing that golfers can always improve on, it’s their drive. The first long drive sets up the foundation for the rest of your shots. A superior tee shot allows you to close the gap and put your focus towards your approach to the green. Improving your drive is all about making subtle changes to your technique. Small nuances can make all the difference in the success of your swing. With continued training, golfers can see a dramatic improvement in power, accuracy, and distance. Here are a few ways to hit longer drives. The position of the ball and tee has a direct affect on where your club makes contact. Even seasoned golfers can have trouble hitting the ball on the “sweet spot“. Located in the center of the clubface, this spot can help achieve more distance with less power. It’s not uncommon for golfers to hit low. Hitting towards the bottom of the clubface results in a low launch and trajectory. The ball may go far with considerable power, but the low launch will cost you noticeable yardage. It also makes the ball spin faster as it travels. Regardless of how powerful your shot was, you’re not going to see the full potential of that power if you don’t make proper contact with the clubface. 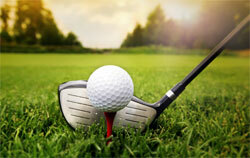 Ideally, you want to hit the ball on the center of the clubface or even slightly above center. To accomplish this, position the tee and ball higher up. This allows you to see results without having to make a drastic change in your actual swing technique. A good way to check the height is to place the club head on the ground next to the tee and position the ball so that it touches the top of the driver. A drive can be affected by your stance. While many golfers already have a stance that’s comfortable and seemingly effective, even the smallest change can be causing them yards of distance. One of the first things you can change is your distance to the ball. A common mistake that golfers make is a wide swing that causes the driver to hit the ball slightly downward. This can be fixed by standing farther back. A good way to measure distance is by using another club. Typically, a full club’s length is suitable. However, you may have to make slight adjustments if you’re using a longer driver. A good rule of thumb is to make sure that your right hand is in front of your chin. This allows you to have a shallow and more controlled swing. Another plane of distance you can manipulate is your horizontal position to the ball. While many golfers will set up the swing so that the ball is in the direct center of their stance, it’s recommended to stand a bit to the right. Your two feet shouldn’t be equidistance from the ball. Instead, the ball should be just inside the left heel. In this position, most of your body is to the right of the ball, which gives you more downswing distance. Your feet should also be an inch or two wider than your shoulders. With the tee slightly higher and in the right position, this stance will result in increased distance. By standing further back and to the right of the ball, you’re setting up to hit the club on the sweet spot and achieving a proper sweep. 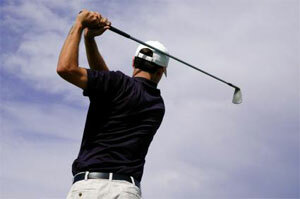 The driver will hit the ball in the center of the face during the upswing rather than a steep downward position. Hitting on the upswing can achieve a considerably higher trajectory. The club will hit it at an angle, driving it higher and farther into the fairway. 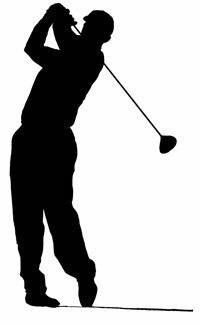 During a drive, the hips should move with the swing and your body weight needs to shift. This all has to happen within a split second, so the body needs to be prepared for the motion before the swing ever takes place. When taking your stance, position your left foot about 45 degrees outward. This angle should be relative to the desired trajectory of the ball. This clears your hips for proper movement. By positioning your foot in this way, your hips can rotate faster and smoother on the swing. You’ll be able to achieve more fluid motion on the backswing as you rotate your lower body back. On the downswing, your hips will be free and clear to move fast. This helps achieve more power and control. In addition to moving the hips, your body weight needs to be placed in the prime position to attain the best results. With your left foot turned outward, most of your body weight should be placed on the back right foot. About 60% of your weight should be positioned back in relation to your target line. A good way to do this is by tilting your upper body to the right. This gives you more stability on the backswing and allows you to build up momentum for the motions to follow. These tips can help you see a boost in distance. While it might not be a significant change to your technique, those minor adjustments will make a huge difference. Even a few extra yards of distance on every drive can help you surpass a plateau and continually improve your game.